President Cyril Ramaphosa has arrived in Geneva, Switzerland, ahead of the launch of the report on the Future of Work produced by the International Labour Organisation's Global Commission on the Future of Work, as well as the World Economic Forum (WEF). The President is in Geneva for the launch of the of the much anticipated report, which will lay the foundation for global action on the challenges that governments, business and labour face amid the convergence of developments in the digital economy, climate change and cyclic economic trends. President Ramaphosa and Swedish Prime Minister Stefan Löfven are co-chairs of the 27-member Global Commission that has been tasked to identify challenges and make recommendations that will sustain and protect the livelihood of workers around the world amid the proliferation of the Fourth Industrial Revolution, climate change and the changing world economic cycle. The Global Commission's report will be launched today at the ILO headquarters and will form part of this United Nations agency's centenary year. Following his address to the ILO, President Ramaphosa will travel to Davos Klosters, where he will lead Team South Africa's participation in the annual meetings of the World Economic Forum (WEF). The President, who is accompanied by Team South Africa, which comprises the leadership of government, business and labour, will use the annual meeting to reach out to international partners and investors as part of efforts to position the country favourably to the rest of the globe. Team South Africa's key messages are set out to tell the international community that the country is open for business. Furthermore, Team South Africa will update investors and finance institutions on the country's path of renewal and growth on which it has embarked. Among the key highlights will be that the country is improving governance of State-owned enterprises, with particular emphasis on Eskom and key institutions such as the National Prosecuting Authority and the South African Revenue Service. 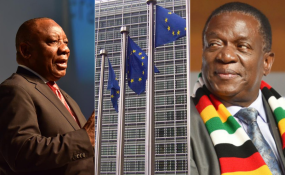 To round off the investment drive, the President is expected to hold bilateral discussions with the Heads of Government of the United Kingdom, Denmark and the Netherlands to discuss matters of interest that are mutually beneficial. He will also hold an international press conference at the WEF Media Village with global television networks, as part of building confidence in South Africa among stakeholders who are not present at the forum. The international WEF gathering is bringing together political, business and broader civil society leadership under the theme 'Globalization 4.0: Shaping a Global Architecture in the Age of the Fourth Industrial Revolution'.